Feel the exciting and adrenalin-pumping action of paintball. Dive through bushes, cover behind trees, and take out the enemy using tactics and team coordination; a thrilling experience of real-time combat. 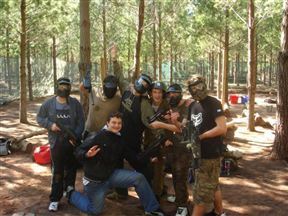 Markers and paintballs are rented and purchased onsite, as well as heavy army jackets if you require them. Avid regulars and social players are all welcome to enjoy themselves. Age limit: players must be above 11 years of age to play. Cost: R120 per player, and R50 per marker. Camouflage gear and the face mask are included. Please note that the use of your own paintballs is not allowed. Action Paintball Area 51 is 2.2km from the centre of Kommetjie , the nearest airport 33.5km (Cape Town International Airport).